Manipulators for Temperature & Sampling for EAF - CEBA S.r.l. The purpose of the machine is to measure temperature, oxygen and carbon contents and take samples inside the electric arc furnace in a fully automatic way. 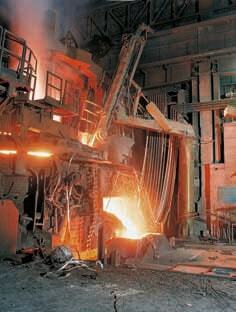 Measurements are carried out by consumable cartridges introduced into the furnace through the slag door. 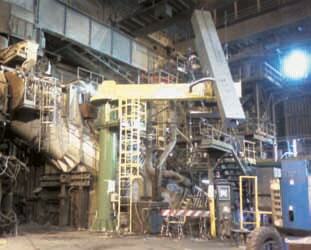 The machine consists of a steel column fixed on the working platform close to the furnace which brings the rotating arm and the lances carrying unit. The arm is moved by an electric gear motor featuring an encoder to enable correct positioning in front of the EAF door. The lances carrying device is a curved steel frame which holds one or two independent carriages, moved by gear motor with chain drive. The whole construction is protected by metallic sheet. The position of the temperature and the sampling lances are monitored by encoders. An anti-collision system is foreseen to avoid any damage for the machine in case of impact with some no liquefied parts. The frontal and lower parts of the manipulator are protected by water cooled panel. The head of the lances is protected by metallic doors opened just for the measurement operations. An electrical blower is installed on the frame for cooling carriages and keeping cleaned them and all their components. The electrical and automation devices allow automatic and safety operation from remote control room and the results will be automatically transferred to the control system and to the visual display unit. The measurement of temperature, oxygen and carbon contents and samples on the electric arc furnace can be also done introducing the consumable cartridges through the roof. CEBA has designed a stand alone and fully automatic system also for this application. 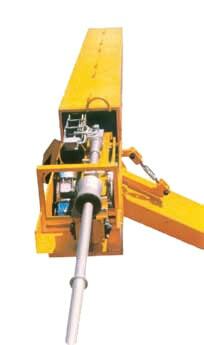 The machine consists of a steel column fixed on the working platform which brings the rotating arm and lances carrying unit. The lances carrying device is a frame which holds one or two independent carriages moved bygear motor with chain drive. The whole construction is protected by metallic sheet. Arm rotation and carriage movements are achieved with electrical gear motors; position of the arm and of the lanced is monitored by encoders. An anti-collision system is installed to avoid any damage for the machine in case of impact with some no liquefied parts. 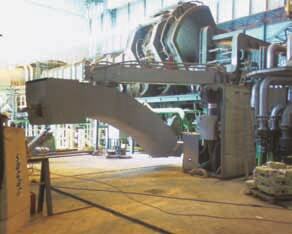 The frontal part of the manipulator is protected by a screen. An electric fan is foreseen for the cooling of the arm and of the carriages. From remote control room the operator can control, in a safe way, the electrical and automation devices. 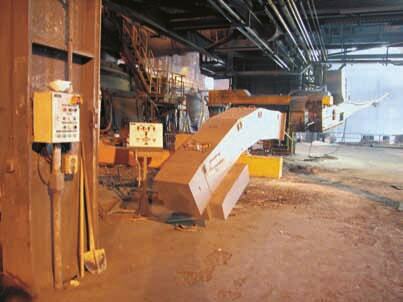 The results will be automatically sent to the control system and to the visual display unit.